Count Alexey Petrovich Bestuzhev-Ryumin (Russian: Алексе́й Петро́вич Бесту́жев-Рю́мин) (1 June 1693 – 21 April 1768), Grand Chancellor of Russia, was one of the most influential and successful European diplomats of the 18th century. He was chiefly responsible for Russian foreign policy during the reign of Empress Elizaveta Petrovna. Alexey was born at Moscow to an old noble family of Novgorod descent. His father, Pyotr Bestuzhev-Ryumin, was later to become the Russian ambassador to the duchy of Courland. Educated abroad with his elder brother Mikhail at Copenhagen and Berlin, Alexey especially distinguished himself in languages and the applied sciences. In 1712, Peter the Great attached Bestuzhev to Prince Kurakin at the Utrecht Congress, that he might learn diplomacy; and for the same reason permitted him in 1713 to enter the service of the elector of Hanover. The elector, who became King George I of Great Britain, took him to London in 1714, and sent him to Saint Petersburg as his accredited minister with a notification of his accession. Bestuzhev then returned to England, where he remained four years. This period laid the necessary groundwork for his brilliant diplomatic career. On his return to Russia, Bestuzhev served for two years without any salary as chief gentleman of the Bedchamber at the court of Anne of Courland. In 1721, he succeeded Vasily Dolgorukov as Russian minister at Copenhagen. Copenhagen at that time formed a nexus of diplomatic intrigue, for George I of Great Britain had the aim of arming the northern powers against Peter the Great, and Bestuzhev received the commission to counteract this. On the occasion of the peace of Nystad (1721), which terminated the Great Northern War's 21 years of struggle between Russia and Sweden, Bestuzhev designed and had minted a commemorative medal with a panegyrical Latin inscription, which so delighted Peter (then at Derbent) that he sent a letter of thanks written in his own hand along with his portrait. The sudden death of Peter the Great (8 February 1725) seriously injured Bestuzhev's prospects. For more than ten years he remained at Copenhagen, looking vainly towards Russia as a sort of promised land from which he was excluded by enemies or rivals. He rendered some important services, however, to the empress Anne (reigned 1730–1740), who decorated him and made him a privy councillor. He also won the favour of Ernst von Biren, and on the tragic fall of Artemy Petrovich Volynsky in 1739, Bestuzhev returned to Russia to take Volynsky's place in the council. He assisted Biren to obtain the regency in the last days of the empress Anne, but when his patron fell three weeks later (November 1740), his own position became precarious. Bestuzhev's chance came when the empress Elizabeth, immediately after her accession (6 December 1741), summoned him back to court and appointed him vice-chancellor. For the next twenty years, during a period of exceptional difficulty, Bestuzhev practically controlled the foreign policy of Russia. At this time, Bestuzhev judged France the natural enemy of Russia. The interests of the two states in Turkey, Poland and Sweden were diametrically opposed, and Bestuzhev considered that Russia needed to fear the intrigues of France in these three countries, all of which bordered it. The enemies of France thus necessarily became the friends of Russia, and her friends were conversely viewed as Russia's enemies. Consequently, Great Britain and Austria became Russia's "natural" allies, while the aggressive and energetic king Frederick II of Prussia, then engaged in the War of the Austrian Succession of 1740–1748, presented a danger to guard against. Bestuzhev therefore adopted the policy of bringing about a quadruple alliance between Russia, Austria, Great Britain and Saxony, to counteract the Franco-Prussian league. However, he stood on dangerous ground. The empress Elizabeth herself had an aversion to an alliance with Great Britain and with Austria, whose representatives had striven to prevent her accession. Many of her personal friends, in the pay of France and Prussia, took part in innumerable conspiracies to overthrow Bestuzhev. Despite these hindrances, Bestuzhev, aided by his elder brother Mikhail, implemented his policy step by step. Russia and Sweden had commenced hostilities in 1741. On 11 December 1742 Bestuzhev concluded a defensive alliance between Great Britain and Russia. He had previously rejected with scorn the proposals of the French government to mediate between Russia and Sweden on the basis of a territorial surrender on the part of the former. Bestuzhev conducted the war so vigorously that by the end of 1742, Sweden lay at the mercy of Russia. At the peace congress of Åbo (January — August 1743) Bestuzhev insisted that Sweden cede the whole of Finland to Russia, thus completing the work of Peter the Great. But the French party contrived to get better terms for Sweden by artfully appealing to the empress Elizabeth's fondness for the house of Holstein. The Swedes, with the encouragement of Elizabeth, accepted Adolphus Frederick, duke of Holstein, as their future king, and, in return, received back Finland, with the exception of a small strip of land up to the Kymmene River. Nor could Bestuzhev prevent the signing of a Russo-Prussian defensive alliance in March 1743. He however deprived it of all political significance by excluding from it the proposed guarantee of Frederick's Silesian conquests. Moreover, through Bestuzhev's efforts, the standing of the Prussian king (whom he regarded as more dangerous than France) at the Russian court fell steadily, and the vice-chancellor prepared the way for an alliance with Austria by agreeing on 1 November 1743 to the Treaty of Breslau of 11 June 1742. The bogus Lopukhina Conspiracy, however, put in place by the Holstein faction, aided by France and Prussia, persuaded Elizabeth that the Austrian ambassador had intrigued to restore Ivan VI to the throne, and alienated the empress from Austria for a time. Bestuzhev's ruin appeared certain when, in 1743, the French agent, Jacques-Joachim Trotti, marquis de la Chétardie, arrived to reinforce his enemies. But Bestuzhev found a friend in need in Mikhail Illarionovich Vorontsov, the empress's confidant, who shared his political views. Still his position remained most delicate, especially when the betrothal between the grand-duke Peter and Sophia of Anhalt-Zerbst (afterwards Catherine II) took place against his will, and Elizabeth of Holstein, the mother of the bride, arrived to promote Prussian interests. Frederick II, conscious of the instability of his French ally, now keenly wished to contract an offensive alliance with Russia. The first step to realising this plan required the overthrow of Bestuzhev, "upon whom," Frederick II wrote to his minister Axel von Mardefeld, "the fate of Prussia and my own house depends." But Bestuzhev succeeded, at last, in convincing the empress of Chétardie's dangerous intrigues, and on 6 June 1744, Chétardie received orders to quit Russia within twenty-four hours. Five weeks later Bestuzhev became grand chancellor (15 July 1744). Before the end of the year Elizabeth of Holstein also was expelled from Russia, and Bestuzhev remained supreme. European diplomacy at this time focused on the king of Prussia, whose apparently insatiable acquisitiveness disturbed all his neighbours. Bestuzhev's offer, communicated to the British government at the end of 1745, to attack Prussia if Great Britain would guarantee subsidies to the amount of some £6,000,000, carried no weight now that Austria and Prussia had started coming to terms. Then Bestuzhev turned to Austria, and on 22 May 1746 concluded an offensive and defensive alliance between the two powers manifestly directed against Prussia. In 1747, he also signed alliances with Denmark and the Porte. At the same time Bestuzhev resisted any rapprochement with France, and severely rebuked the court of Saxony for its intrigues with Versailles. About this time he felt hampered by the persistent opposition of the vice-chancellor Mikhail Vorontsov, formerly his friend, now his jealous rival, whom Frederick the Great secretly supported. 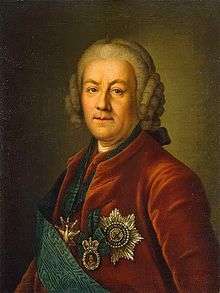 In 1748, however, Bestuzhev was able to have Vorontsov removed by proving to the empress that Vorontsov had received money from Prussia. The hour of Bestuzhev's triumph coincided with the peace congress of Aix-la-Chapelle (April to October 1748), which altered the whole situation of European politics and introduced fresh combinations: the breaking away of Prussia from France and a rapprochement between England and Prussia, with the inevitable corollary of an alliance between France and the enemies of Prussia. Bestuzhev's strong political prejudices at first prevented him from properly recognising this change. Passion had always been too large an ingredient in his diplomacy. His Anglomania also misled him. His enemies, headed by his elder brother Mikhail and the vice-chancellor Vorontsov, powerless while his diplomacy seemed faultless, quickly took advantage of his mistakes. When the Anglo-Prussian and Franco-Austrian alliances were formed in the first half of 1756, Vorontsov advocated the accession of Russia to the latter league, whereas Bestuzhev insisted on a treaty with Great Britain. But his influence had started to wane. The totally unexpected Anglo-Prussian alliance had justified the arguments of his enemies that England seemed impossible to deal with, while his hatred of France prevented him from adopting the only alternative of an alliance with her. To counter the covert intrigues against him, Bestuzhev now proposed the erection of a council of ministers to settle all important affairs, and its first session (14–30 March 1756) proposed an alliance with Austria, France and Poland against Frederick II, though Bestuzhev opposed any arrangement with France. He endeavoured to counteract his failing influence by a secret alliance with the grand-duchess Catherine, whom he proposed to raise to the throne instead of her Holstein husband, Peter, from whom Bestuzhev expected nothing good either for himself or for Russia. He conducted negotiations through the Polish king Stanislaus Poniatowski. The inclusion of Russia in the anti-Prussian coalition (1756) in the Seven Years' War (1756–1763) occurred over Bestuzhev's head, and the cowardice and incapacity of his friend, the Russian commander-in-chief, Stephen Apraksin, after winning the Battle of Gross-Jägersdorf (30 August 1757), became the pretext for overthrowing the chancellor. His unwillingness to agree to the coalition became magnified in opposition accounts into a determination to defeat it, although his opponents never proved anything against him. Nevertheless, he lost the chancellorship and suffered banishment to his estate at Goretovo (April 1759), where he remained till the accession of Catherine II (28 June 1762). Catherine recalled him to court and made him a field marshal. However, he took no leading part in affairs and died on 21 April 1768. 1 2 3 4 5 6 7 8 9 10 11 12 13 14 15 16 17 18 Chisholm 1911. This article incorporates text from a publication now in the public domain: Bain, Robert Nisbet (1911). "Bestuzhev-Ryumin, Alexius Petrovich, Count". In Chisholm, Hugh. Encyclopædia Britannica. 3 (11th ed.). Cambridge University Press. R. Nisbet Bain, The Daughter of Peter the Great (London, 1899). The Winter Palace by Eva Stachniak, Chancellor and the teacher of spies to the main character.